It’s time for our 2017 Great Pyrenees Holiday Gift Guide with all gifts targeted to our double-coated, giant floofs. If you’re still doing some holiday shopping (please tell me I’m not the only one), we’ve got you covered. 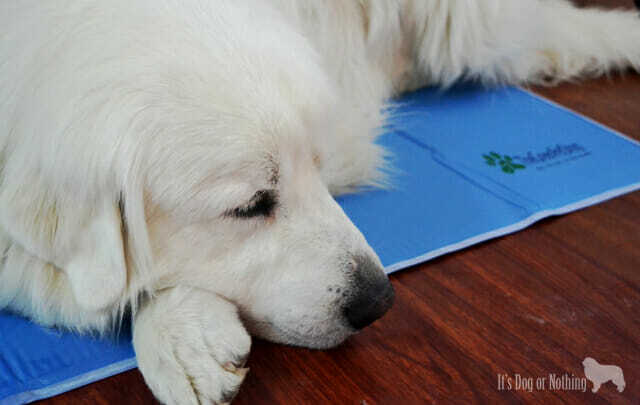 The Green Pet Shop Cool Pet Pad: We have four, yes four, cooling mats. I even have one at work for Kiska which I take with me to meetings for her. For a breed that always seems to be hot, these are a must! Caru Daily Dish: Available in four flavors, these are a great topper (or full meal!) for your floof. The fluffies are loving the Lamb & Turkey and Beef recipes. 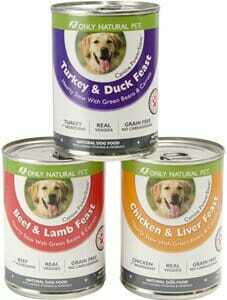 Only Natural Pet Wholesome Homemade: These are another favorite topper of ours and great for picky eaters! Best Bully Sticks Candy Canes: Trade in those harmful rawhides for this festive twist! The candy cane shape makes it more challenging and last a bit longer. Only Natural Pet Pumpkin Spice Biscuits: For our PSL loving friends, pass the love onto your pups! The spicy cinnamon and pecans make this an extra festive treat. FreshWave Odor Removing Shampoo: Your dog might not like this gift as much, but this is one of my favorite shampoos. Super gentle and the smell is incredible – no overpowering perfume smell. Bravo Crazy Curly Chew: This gift is primarily with Kiska in mind (shh, don’t tell her!) because she is obsessed with curly bully sticks. The shape makes it more mentally stimulating, which we know these giant floofs need. Ollie Dog Food: The floofs go absolutely nuts for this fresh, customizable dog food. 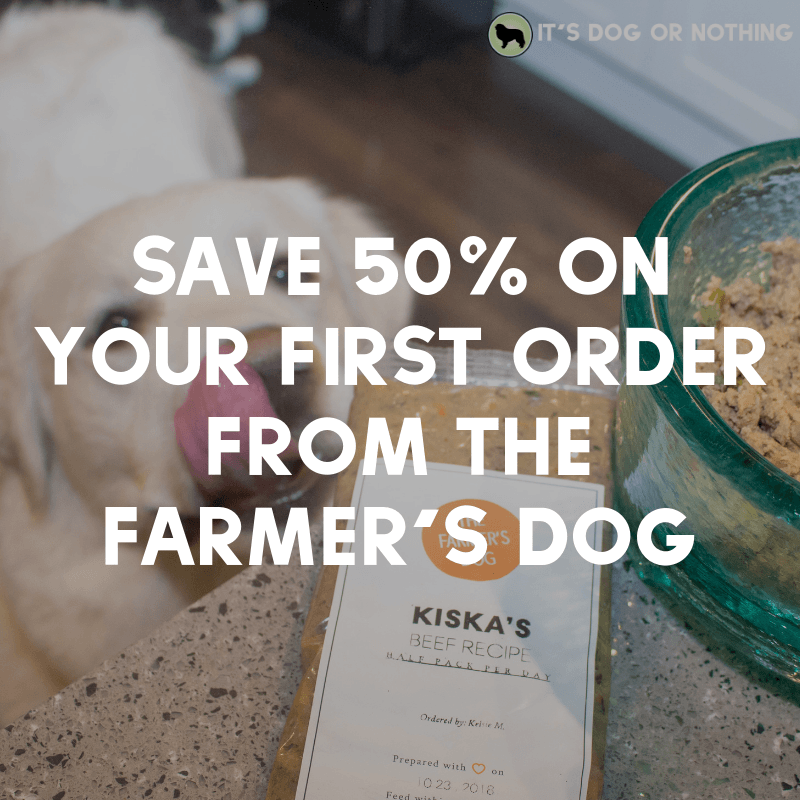 New dogs get 50% off their first box of meals! The Stuff Dog Conditioner: This is one of my tricks to get the fluffies’ coats silky and soft. A little goes a long way so this conditioning spray lasts a long time. Only Natural Pet RawNibs: These are my go-to training treat – every dog goes crazy for them! Spice up their stocking with these tantalizing treats. 4Knines Seat Cover: Every pyrent NEEDS a seat cover or cargo liner from 4Knines. We have one in each vehicle and I recommend them to everyone I know. They are the best quality I’ve found and last for years (we’ve had one for over three years and it is still in perfect condition). Did you find anything to add to your holiday gift list? What is your dog getting for Christmas? 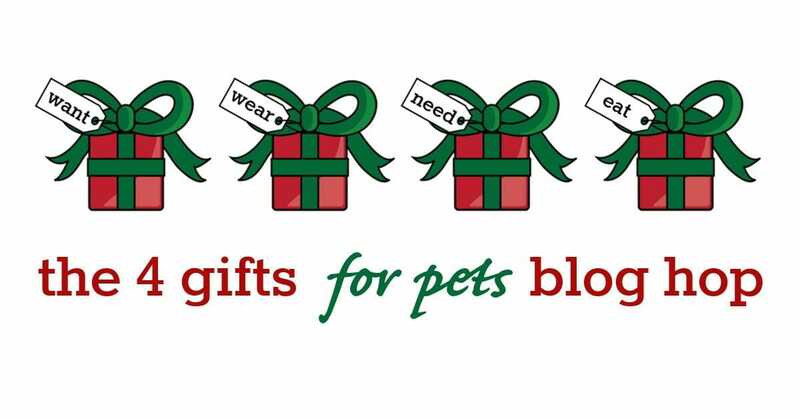 We’re back with another year of the 4 Gifts for Pets Blog Hop, but this year is even better than ever. Why, you ask? Because this year we have an amazing giveaway going on! Before we get to the prizes, let’s meet our fabulous hosts and the other amazing bloggers joining this year. Kol’s Notes and A Dog Walks Into a Bar – like a crime-fighting duo, only ridiculous. Since we’re doing this for pets, we’re going to substitute “something to read” for “something to eat”. Do you feel guilty every time you leave your dog alone for long periods of time? Try challenging your dog’s mind to some puzzles to keep him busy and out of trouble! I am beyond fascinated by the CleverPet Hub and am just dying for the fluffies to give it a try. Three drooly, dirty dogs share water bowls in this house and believe me – they get gross. We have another PetSafe fountain that I absolutely love, but we need to replace the other water bowls around the house with these amazing fountains to keep the fluffies hydrated. Floofy dogs in the pacific northwest. Need I say more? Since Kiska goes to work with me every day, we have to do potty walks in the rain. I hate having a wet floof come back into the office with me, so a rain jacket is on her Christmas list this year. If you need a high-value training treat, these green beef tripe nibs are the pyrfect choice. The fluffies know exactly what these are before I even open the bag! Now, on to the giveaway! Enter below for your chance to win and don’t forget to swing by the other bloggers in the hop for even more entry opportunities! Were doing something fun this giveaway as a special to all of you amazing people who follow the fluffies on social media! Every day well be sharing a daily bonus word or phrase on social media. Simply find the daily bonus and come back to this post to claim five extra entries. The bonus will be posted on a different site each day, so make sure you’re following It’s Dog or Nothing on Facebook, Twitter, Instagram, and Pinterest! 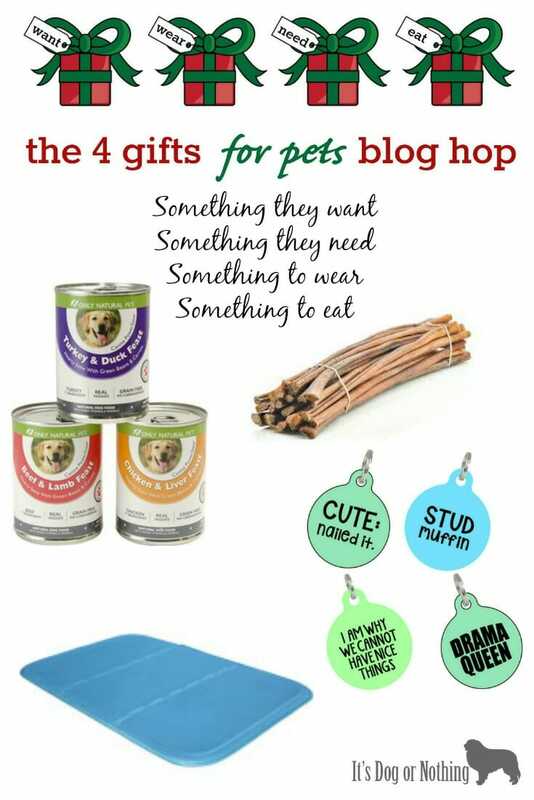 4 Gifts for Pets Giveaway – IDON Disclosure: The 4 Gifts for Pet Giveaway Hop is sponsored by CleverPet. The opinions and ideas in this post are my own and are uninfluenced by any other person or business. The individual sponsors are responsible for their giveaway prizes including shipping. This post includes affiliate links. If you purchase something, I may receive a small commission. There is no extra charge to you and it helps me keep It’s Dog or Nothing running. Struggling with what to get your Great Pyrenees for Christmas this year? Maybe you just need a few stocking stuffers to round out the gifts. If you’re looking for ideas, here are 10 of our favorites (tested and approved by Mauja and Atka!). XXL Kong. You can never have enough Kongs around the house. We stuff Kongs with wet food and give them to the fluffies before we leave for work. Jones Natural Chews Windees. If you’ve been here for awhile, you’ve more than likely heard us talk about Windees. Not going to lie, they’re pretty gross (especially as a vegetarian), but the fluffies go nuts for them. Bully sticks. Another fluffy favorite. We seem to find the best deals and quality bully sticks from Best Bully Sticks. Plus, they have many other chews and treats as well! Oster Grooming Rake. Keep the coat looking wonderful and functioning properly with a high-quality grooming rake. We’ve tested several over the years and have yet to find one we like more than this! Freedom Harness. This no-pull harness is great because it clips on the back (rather than the front like most no-pull harnesses). The material is durable and long-lasting. Big Barker Bed. If your pyr will actually use a bed rather than sleep on the hard floor, a Big Barker bed is a great choice. While it’s a pricey bed, you can’t beat the quality of the bed itself. What will you be getting your dog for Christmas? 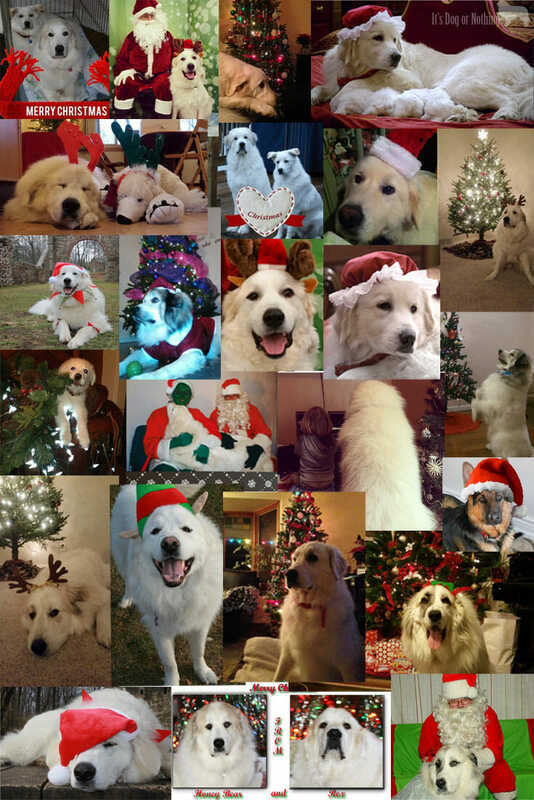 Facebook has been full of Christmas themed photos recently, but I’ve been particularly drawn to the Great Pyrenees ones (obviously!). 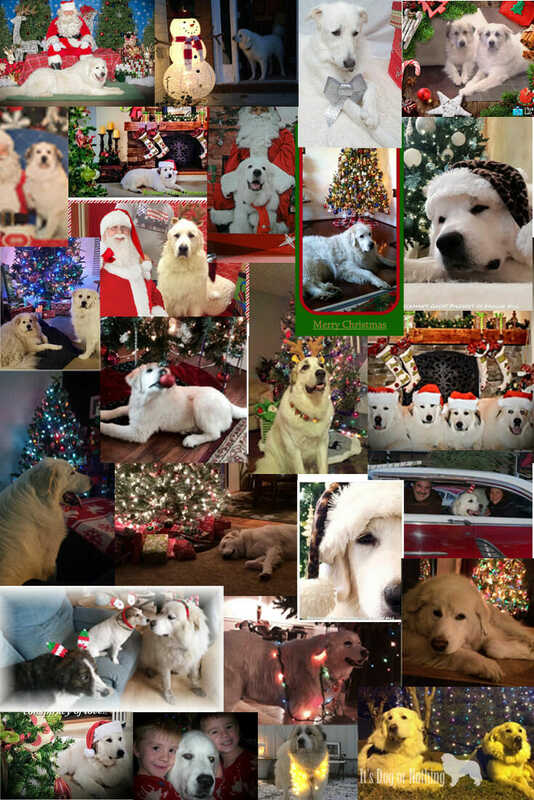 I decided to ask people to share their photos so I could create a blog post of Christmas pyrs. I received a TON of amazing photos – too many to put in a single post – so I created a few collages of the photos. So here it is, a Pyrenean Christmas <3 If you’d like to see the photos in full size, you can head to this Facebook album! Can’t get enough of the photos? Head here to see them all! 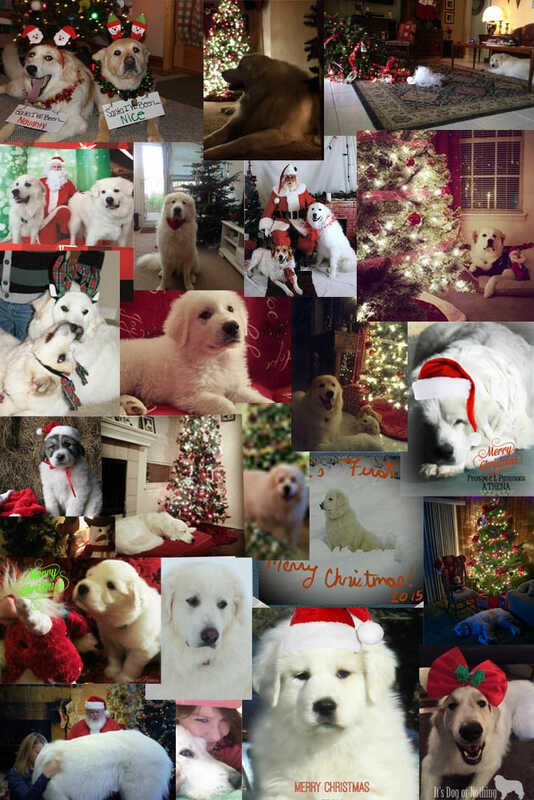 Last week we shared the Ultimate Great Pyrenees Lover Gift Guide to get in the holiday spirit. If anyone is still looking for gifts for me (ahem, Nick), anything off that list will do 😉 Now, it wouldn’t be fair if I didn’t make a gift guide for the pups, too! Mauja and Atka get stuffed stockings on Christmas and we always have a blast watching them tear through the wrapping paper. I’ll have to find the video of Atka on his first Christmas – talk about adorable! Even though we came up with our 4 gifts for Mauja and Atka already, I wanted to share some variety for those that might not have found something they would like on that list! The Tug-A-Mals toys are Atka’s absolute favorite! The center is a giant, squeaky ball that can still be played with once the outside is shredded. He will run around the backyard squeak-squeaking away with the ball. It’s absolutely adorable. Plus if you say, “where’s your ball?”, he runs and grabs it. I know I talk about these all the time, but it’s because I truly think they’re amazing. Kongs are so versatile and great for keeping your pup busy. Put your dog’s favorite snacks inside and freeze for a long-lasting toy! Mauja and Atka like frozen wet food in their Kongs. I’m not going to lie – the suckers smell. I’d suggest lighting a candle when breaking out these chews. However, they are one of our longer lasting chews and the fluffies go crazy for them. These are my go-to high-value training treat. Once again, they smell, but when we’re working in highly stimulating environments, I need something that really gets their attention. These always do the trick. These definitely excite me much more than the pups, but I’m not ashamed to admit it. Guys, these are made with REAL SNOWFLAKES. Could there be a more awesome treat?! Best Bully Sticks offers a wide variety of sizes of bully sticks so you can find one that will last for your dog. Mauja and Atka are particularly fond of the 6″ Jumbo bully sticks, but I’m sure they would prefer even larger ones! 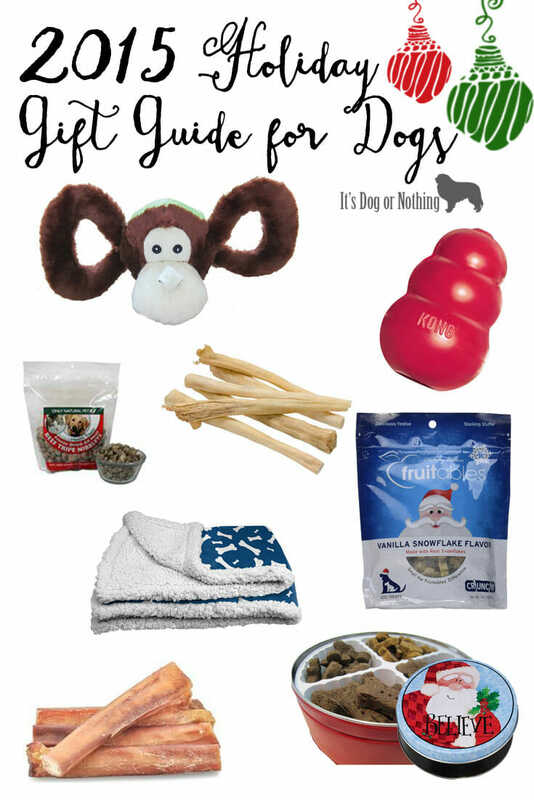 That wraps up It’s Dog or Nothing’s Holiday Gift Guide for Dogs! What’s on your dog’s list this year? 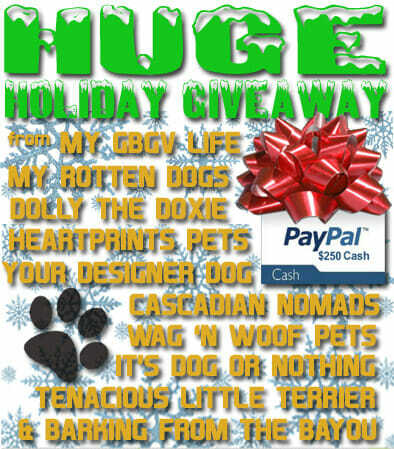 Last year, we teamed up with some amazing pet bloggers to hold a fantastic giveaway. You only need to enter on one blog, but you can improve your chances of winning by entering the giveaway on each of the above blogs. This will give you more entries and a higher probability of winning the prize of $250 Paypal cash! Get started here on It’s Dog or Nothing and then make your way through the list. One grand prize winner will be chosen from the combined entries on the ten participating blogs. Good luck and happy holidays! Since this is being done for pets rather than for children, “read” can easily be swapped with “eat”, if you’d prefer! I know Atka (AKA Mr. Paper Shredder) would ruin any lovely book 😉 Here’s the gifts I would give Mauja and Atka if following the “4 gifts” approach. 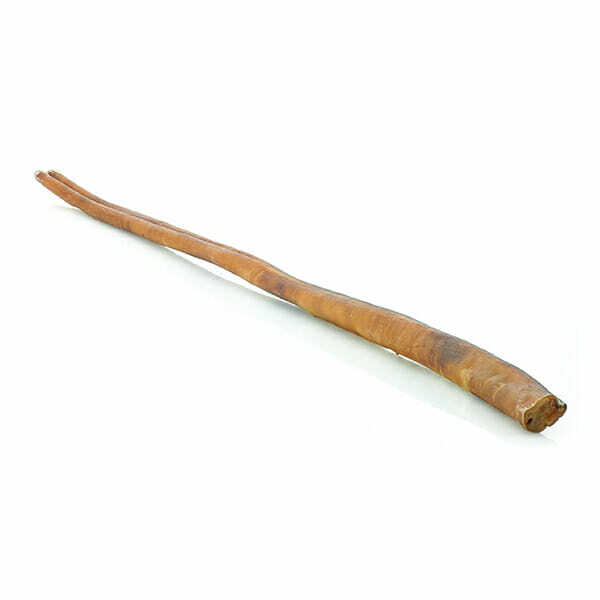 These Bully Canes from Best Bully Sticks are between 28-36″ in length so they are recommended for large dogs and aggressive chewers. Mauja and Atka LOVE bully sticks, so I know they would want this treat. The question is – will it slow them down? This Cooling Pad from the Green Pet Shop is fantastic. We received one to review a few months ago, but we have two dogs! Mauja and Atka do a good job of rotating, but they really need another one! 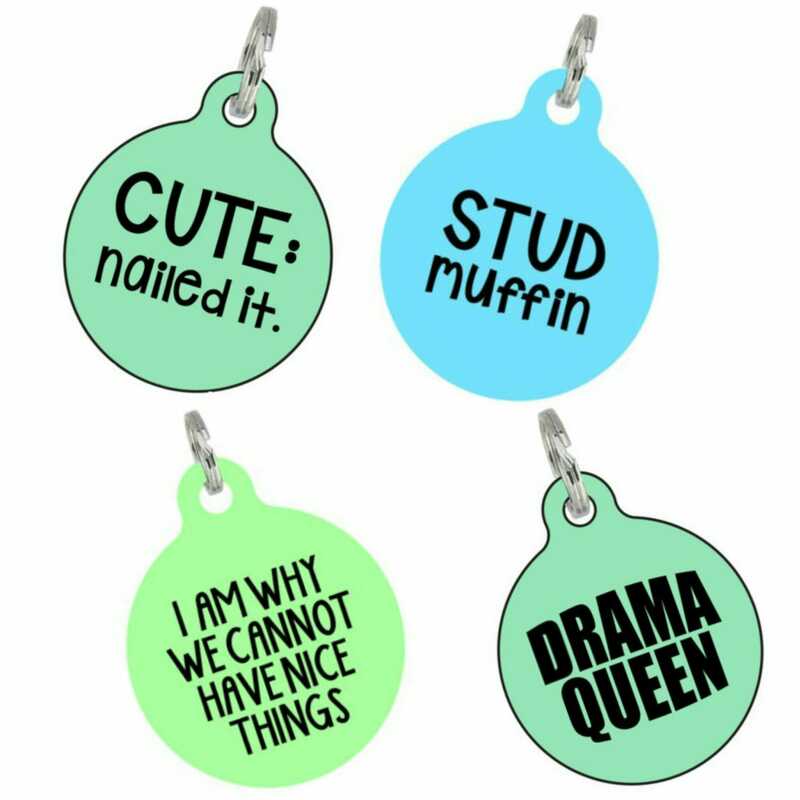 BadTags on Etsy has an amazing selection of ID tags with tons of fun sayings! Mauja and Atka’s current tags are pretty boring, so it’d be fun to spice it up! These four are current contenders. Can you guess who would get each? The Only Natural Pet PowerStew has become a fluffy favorite. The chunks of meat make it ultra-appetizing as a topper, but it’s also great for mental stimulation by stuffing in a Kong and freezing. If you were to follow the 4 Gifts for Pets approach, what would be on your pet’s Christmas list this year? Make sure to visit the other blogs in the hop and see what’s on their lists! I can’t believe Christmas is almost here. I feel like I don’t remember anything between the months of July and November. Anyone else feel that way? Since I always get a late start on Christmas shopping (and I can’t be the only one! 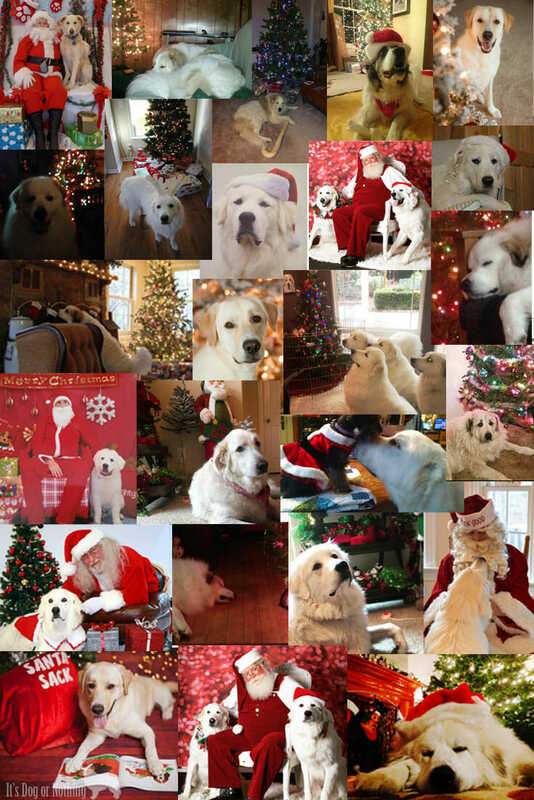 ), I made this Great Pyrenees Lover Gift Guide to simplify shopping. Email it to your spouse, family, and friends as a *hint hint* for your Christmas gifts! Great Pyrenees Bottle Stopper – Amazon. Are you a wine lover? If you ever don’t finish a bottle (does anyone really do that? ), then you need this adorable stopper! Great Pyrenees 2016 Calendar – Amazon. I get a new Great Pyrenees calendar every. single. year. and I love it so much. “I Hug My Great Pyrenees So I Don’t Choke People” Tee – SunFrog. Can anyone else relate? Plus, they’re just so huggable! Great Pyrenees Photo on wood pieces – Outer Barks. I think this picture is just stunning. I also love how it shows a couple of a pyr’s key traits. “Home is Where My Pyrenees Is” Sign – pigknit, Etsy. I’ve contemplated getting a “Home is Where the Air Force Sends Us” sign, but I feel this is much more appropriate! Great Pyrenees Etched Wine Glasses – Amazon. Another gift for the wine lover or anyone who just likes to drink out of fancy glasses! Great Pyrenees Messenger Bag – Painted Pooches, Etsy. Show your love of pyrs wherever you go with this adorable messenger bag! “Pyr Mom” Decal – Amazon. I’m not the biggest fan of car decals, but I could totally see myself sporting this one! Great Pyrenees Mug – GreatPyreneesRescue, Etsy. A way to enjoy pyrs while sipping your morning coffee (other than the obvious pyr fur in your coffee). Plus, these benefit a Great Pyrenees rescue! Great Pyrenees Zombie Slayer Bowl – Zazzle. Although, I have talked about why we’d never survive the zombie apocalypse. I think I’m going to send this to my husband and hopefully receive a few items from this list! 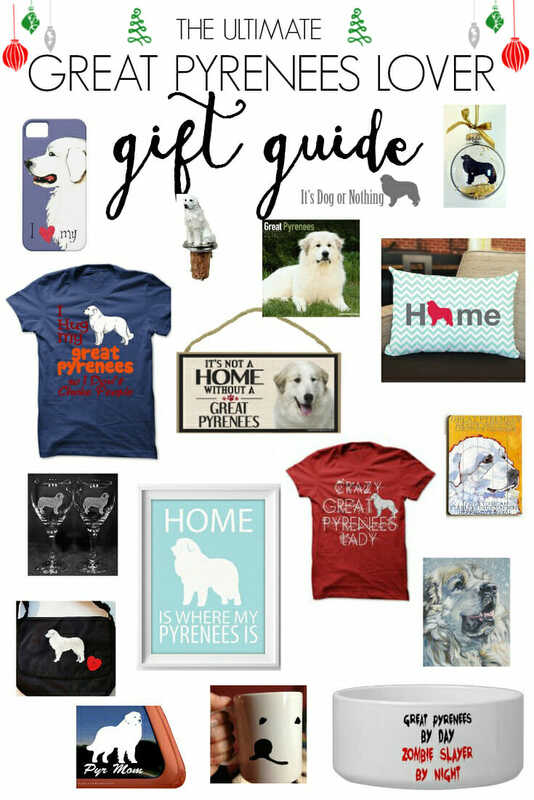 What item would you love to have from Great Pyrenees Lover Gift Guide? Any other items us pyr lovers need?